The auto pilot feature of the Hermes 450 enables the UAS to land automatically. The Universal Ground Control Station (UGCS) of Hermes 450 GCS can control all UAVs in the Hermes family. A Hermes 450 UAS of the US Customs and Border Protection. A Hermes 450 UAS operated by Brazilian Air Force. Image courtesy of Brazilian Air Force. A Hermes 450 Unmanned Aerial System (UAS) taking off from the runway. Hermes 450 is a multirole high performance tactical Unmanned Air System (UAS) developed by Elbit Systems. It has been serving as the main Intelligence, Surveillance, Target Acquisition and Reconnaissance (ISTAR) platform for the Israel Defense Forces for more than a decade. Hermes 450 formed the basis for the development of unmanned aerial vehicles, such as Watchkeeper WK450 and Hermes 900. 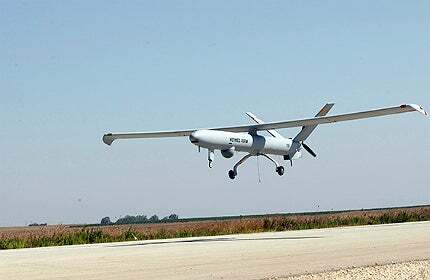 Hermes 450 is the first UAS to fly with the approval of Civil Aviation Authority of Israel (CAAI). The UAS is mainly designed to assist the armed forces to conduct ISTAR missions. The UAS is operational in more than 20 countries and has accumulated more than 300,000 flight hours. The major operators include the Israeli Air Force, Azerbaijani Armed Forces, Brazilian Air Force, the Republic of Singapore Air Force, Georgian Air Force and Cyprus Air Force. "Hermes 450 formed the basis for the development of unmanned aerial vehicles, such as Watchkeeper WK450 and Hermes 900." Elbit Systems was awarded a $47m contract by the Israeli Ministry of Defense in June 2003, to supply Hermes 450 systems to the Israel Defense Forces (IDF). In November 2007, IDF placed a $30m order for the supply of additional Hermes 450 UAS. The contract also includes funding for the upgrade of existing UAV platforms. The Brazilian Air Force placed an order with Aeroeletronica, a Brazilian subsidiary of Elbit Systems, for Hermes 450 systems in January 2011. Elbit Systems received a $10m order to deliver mixed fleet of Hermes 450 and Hermes 900 systems to Colombia, in August 2012. The Hermes 450 incorporates a high wing design. The cylindrical shaped fuselage is attached with straight wings. The tail section integrates V-tail design to reduce the drag and decrease its radar signature. "Elbit Systems received a $10m order to deliver mixed fleet of Hermes 450 and Hermes 900 systems to Colombia, in August 2012." The UAS is designed to support long endurance and concealed operations. The low fuel consumption ensures long endurance and allows the supply of power to onboard electronics for longer periods. Hermes 450 carries dual payloads at a time and can support a wide range of sensors. The maximum payload capacity of the UAS is 180kg. Electro-Optical (EO)/Infrared (IR) cameras carried by Hermes 450 allow it to capture high quality imagery during day or night. The payload also includes Laser Designator to assign targets. Payloads such as Synthetic Aperture Radar (SAR), Ground Moving Target Indication (GMTI), Medium Power Radar (MPR) and Automatic Identification System (AIS) are integrated into the vehicle to provide the situational awareness, as well as to indicate and identify targets. The Electronic Intelligence (ELINT), Electronic Warfare (EW), Communication Intelligence (COMINT) and COMM JAM payloads impart communication ability to the vehicle. Hermes 450 can also carry a newly developed hyperspectral payload. The payload enables the UAS to map the area at different wavelengths simultaneously and to acquire the spectral signature of the materials. The hyperspectral payload provides the ability to identify, measure and track objects which are difficult to obtain with other sensors, and to find invisible objects and unsafe materials. It is interfaced with a ground section that interprets the images and the data collected by the payload. The UAS is fully autonomous from the time of take off to landing. Auto pilot of the Hermes 450 enables the vehicle to take off and land safely. The vehicle can also be controlled completely by a Universal Ground Control Station (UGCS). The British version of Hermes 450 uses inertial navigation system. Hermes 450 is powered by an R902 (W) Wankel engine delivering 52HP at 8,000rpm to a double bladed pusher propeller. The engine is supplied by UAV Engines in the UK. Hermes 450 can be controlled by mobile / fixed UGCS. The same UGCS allows the operators to control all UAS in the Hermes family. The UGCS features a ground data terminal (GDT), a remote video terminal and a flight line tester / loader. The UGCS has two consoles, one acting as a spare console. The software of the system enables in-flight mission editing and operation of payloads. The UAS can simultaneously conduct two missions with a single GCS and two GDTs. Hermes 450 can reach up to an altitude of 5,486m with a rate of climb of 4.6m/s. The UAS has a maximum speed of 176km/h and a cruising speed of 130km/h. It can be operated in adverse weather condition from semi-prepared runways. The UAS can operate for 17 hours and the endurance can be extended up to 30 hours with the integration of external fuel tanks. The aircraft has a maximum range of 300km. Patroller is a remote-controlled medium-altitude, long-endurance (MALE) unmanned aerial vehicle (UAV).